This gorgeous petite vintage style birdcage veil has clear sparkling Austrian crystal rhinestones lightly scattered over the veil. It is made of French netting and measures 8 inches from top to bottom and 12 inches wide. It is attached to a 2 inch metal hair comb for easy placement and wearing. The veil can be positioned on top of the head, to one side, or over the face at your desire. 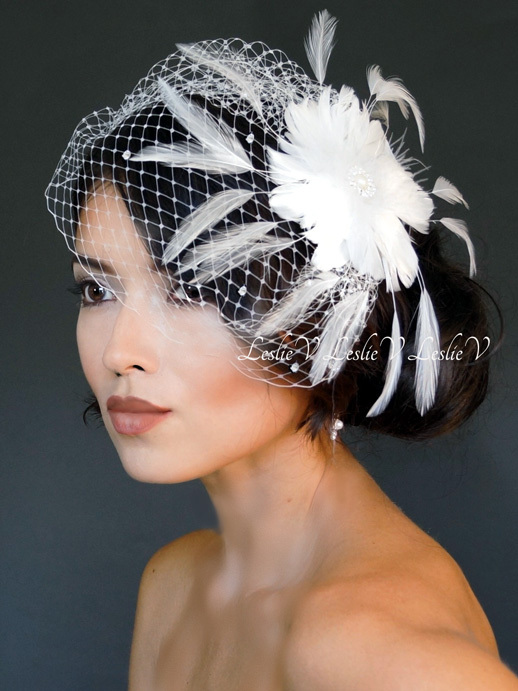 Hair pins are used on the top and sides to position the veil into place. Included is a detachable Pearl/Crystal Feather Fascinator Clip. 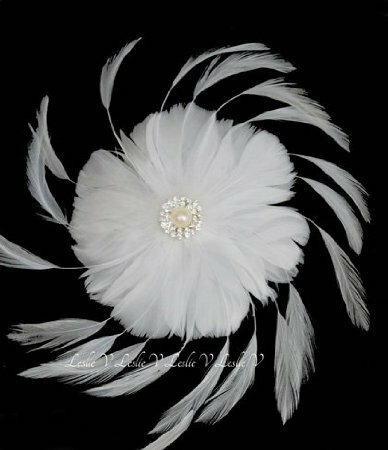 The main feather measures approximately 4 inches x 4 inches with longer feather sprays. The back of the fascinator has 2 functions: there is a slide in hair clip and a brooch pin closure. Styling instructions included. Shop Lovely, Be Lovely!